Background: Diabetes and its associated complications like nephropathy and neuropathy have been identified as a worldwide problem. The epidemiological data revealed that there is up to 60% of patients suffering from diabetic peripheral neuropathy (DPN) which is associated with significant morbidity, including gait disturbances, amputations, anxiety and depression. The various dietary interventions play a significant role in the prevention of these chronic ailments. The therapeutic investigation of new dietary interventions for the management of diabetes and their related complications are evidently proved by numerous animal and human studies which further help in translating these nutritional improvements for the betterment of healthcare system. Objective: Various scientific researches demonstrate that dietary therapy and their interventions prove to be beneficial and therapeutic for the management of diabetes and their associated chronic complications. 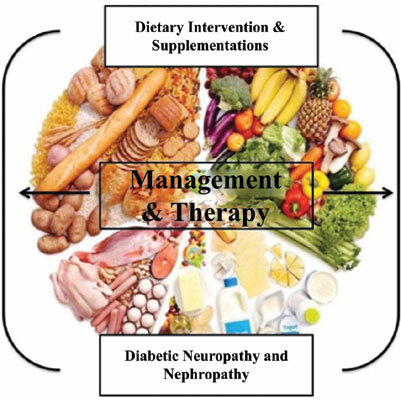 The aim of this review is to describe the various aspects of diet restriction or diet therapy for the management of diabetic neuropathy and nephropathy. Method: The systematic bibliographical research was done with the help of PubMed, Google scholar and MedLine literature survey to identify all suitable association between diet restriction and diet therapy with diabetic neuropathy and nephropathy. Results: Our searches yielded approximately 180 appropriate citations, from which we included 35 relevant scientific pieces of evidence in the present review. Conclusion: It is clearly stated that inappropriate and unbalanced dietary habits cause devastating effects on the progression of diabetes and associated complications. However, dietary supplementations and interventions act by normalizing the nerve conduction velocity, brain oxidative stress and by repairing the damaged neuronal cells and maintain the normal conduction pathways of the brain. The focus of the current review is on the various preclinical evidences with reference to various dietary modifications for the management of diabetic neuropathy & nephropathy. Still, there is a need to explore new insight mechanisms of dietary supplements for the treatment of diabetes-associated complications of human health. Diabetic neuropathy, diabetic nephropathy, dietary, intervention, nerve conduction velocity, oxidative stress.